First off, here’s a link to the original thread on this topic, from which most of this tutorial is derived. Many thanks go to @Altitude, who first conceived of this solution and figured out the wiring details. There’s nothing wrong with the old thread, and there’s a lot of good information there, but I thought it would be good to get a fresh thread going with a clearly laid out tutorial. The old thread, while useful, has a lot of obsolete and occasionally conflicting information, is organized as a discussion between members rather than a tutorial, and is missing some possibly important information depending on the parts you use. So while the old thread is great reference material, this is more of a step-by-step, newbie-friendly guide. If the mods disagree, feel free to merge this into the old thread. The MB-6582 is designed to be fed 9VAC and 5VDC, i.e. what a Commodore64 PSU puts out. This is convenient for a few reasons—the MB-6582 needs 2-3 different voltage rails to function anyway, and a lot of folks making SID synths are probably already interested in C64s and may have an extra PSU—but inconvenient for other reasons—AC power must be rectified immediately, C64 PSUs are notorious for breaking and taking out SID chips with them, and any replacement PSUs are expected to also put out multiple voltages, which is uncommon and expensive. This tutorial aims to solve for these disadvantages by reducing the power input to a single 12-15VDC source (aka a common wall-wart). A few people in the old thread were getting confused about the PSU Options in the official build documentation, and where this setup falls in those categories. It’s closest to PSU Option C, but for the sake of simplification, let’s just call it PSU Option E. It’s its own thing. There are a few “sub-options” depending on whether you want to run all 8580/6582s, all 6581s, or a combination, but as a whole, this option stands on its own. - You will need a power supply. For 6582/8580-only builds, you want 12VDC. For 6581-only or mixed-SID builds, you want 15VDC. For either setup, you probably want at least 1.5A. You may be able to get away with less amperage, especially if you’re not using the maximum number of PICs, SIDs or LEDs. - You will not need B1 (the bridge rectifier). - You will not need C14 or C13 (although if they’re installed already, it doesn’t hurt anything). - C3 will be 10uF instead of 2200uF (you can just steal C13 if you’ve already ordered). - V4 will be a 5V switching regulator. Recom R78B5.0-1.5 (Mouser part #: 919-R-78B5.0-1.5) seems to be a good choice. There are other parts that will probably work. There are other brands, other Recom parts, etc. Some of them are discussed in the older thread, although some of those options are now obsolete. Pay attention to current output. For a full 4-core, 8-SID, complete control surface MB-6582, 1.5A is recommended, although. You may be able to get away with 1A, especially if you’re leaving out some SIDs/PICs/LEDs. If you don’t want to experiment, just buy this one. - You will need a few small jumpers (I used headers and shunts, but discarded resistor legs soldered to the board will work fine too) and a couple longer, insulated jumpers (I used some solid-core hook-up wire I had handy). - Jumper pin 2 and pin 3 of J71. 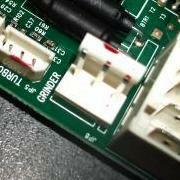 This connects V1 common pin to ground. - Jumper pin 2 and pin 3 of J72. 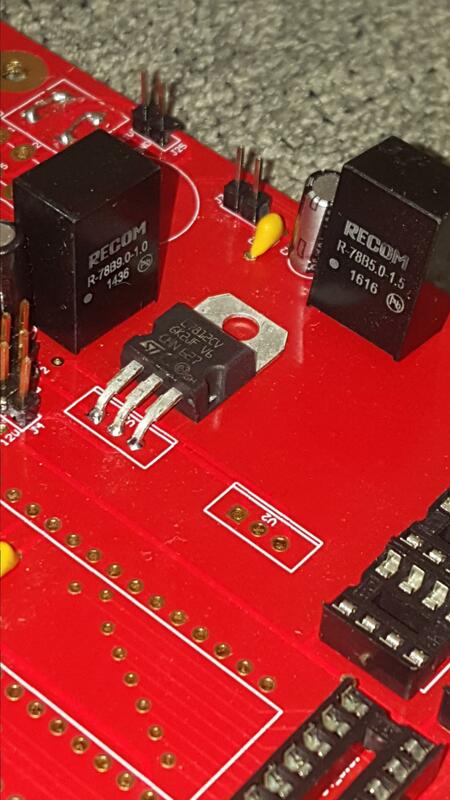 This connects V1 output to 9V rail. - Jumper pin 1 and pin 2 of J73 and pin 2 of J74. 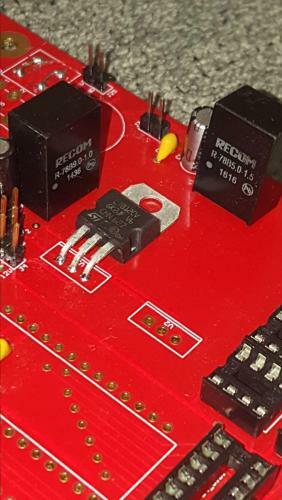 This connects the output of V4 to 5V rail (as well as a few smoothing caps). If you take a look at my photos, you can see I used just one piece of wire to jump all three pins—a short, uninsulated section on the top of the board to jump J73 pins 1&2 together, with a longer, insulated section underneath the board between J73 pin 2 and J74 pin 2. I felt that this was the cleanest possible installation, as it keeps all extra wiring on the solder side of the board. However, you may find it easier or prettier, especially if you’re modifying an already built MB-6582, to wire up slightly different points. Check out Altitude’s photos in the old thread for an alternate wiring scheme, or follow traces on the PCB (nice diagram here: http://www.midibox.org/dokuwiki/lib/exe/fetch.php?media=mb-6582:mb-6582_base_pcb_r2_color.pdf) to come up with your own. - Jumper the “~” and “+” pins of B1 (the two pins closest to S1; see photos for clarification) and pin 1 of J74. 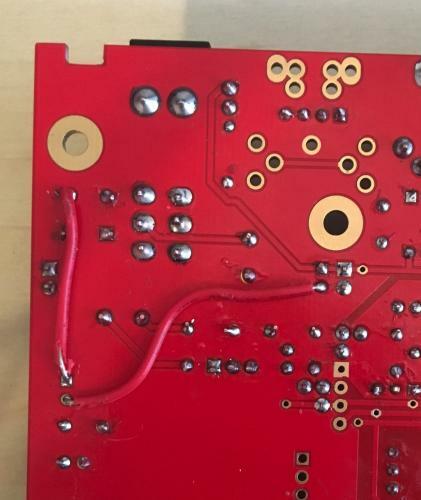 Just like the previous step, you can use one piece of wire to jump all three points and keep the top of the board looking clean, or choose your own wiring scheme according to your needs. - Jumper the “-“ and “~” pins of B1 (the two pins closest to C1; see photos for clarification). Important note: there are two pins on B1 labelled “~”. Pay attention to which one you’re bridging to where. Look at the photos! - Install V1. Pay attention to pinout. The square (rightmost) pad is pin 1 (input). 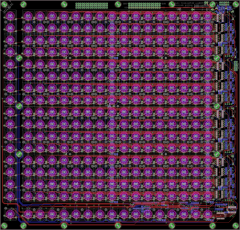 If you want to use only 8580/6582 SID chips, you are done! Make sure all your SIDs have a shunt installed at J1_SIDx and J2_SIDx connecting them to the 9V rail and you are good to go. 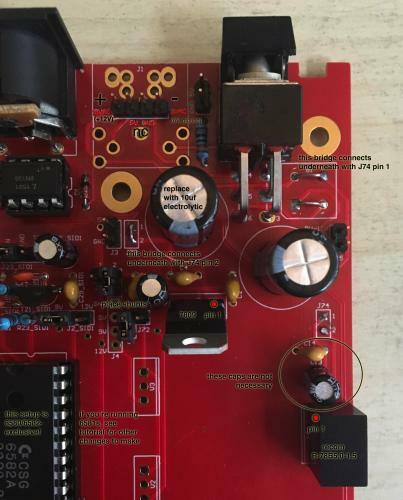 - V4 stays the same—you still want your 5V switching regulator. Pay attention to pinout. The square (bottommost) pad is pin 3 (output). - V1 changes from a 7809 to the 9V sVreg, as noted in the BOM changes. Pay attention to pinout. The square (rightmost) pad is pin 1 (input). - V3 must be stuffed with a 7812. Pay attention to pinout. The square (topmost) pad is pin 1 (input). - You must install an additional jumper wire between the input of V3 and the main 15V line. J72 pin 1 is an obvious place to connect to V3, and the J25 pin “9V-11V” (possibly unused pad) or pin 1 of V1 (shortest possible jumper) are good places to connect to the 15V line, though you have plenty of choices. No matter what type of SIDs you use, the only other thing to pay attention to is the polarity of your DC power. The two 9VAC pins of the power connector/header are your new 12 or 15VDC + and -. If you bridged B1 the same as shown in my photos (double check! ), then the square (leftmost) pad of J1A, or the bottom left pad of J1, is +12V or +15V. The rightmost pin of J1A, or the bottom right pad of J1, is 0V (ground). Here are some images. Sorry the text turned out so small, you will probably have to click on the image and display it full-size to read it. I proofread this a couple times, but if anyone spots any typos or corrections that need to be made, or has any suggestions for info to be added, just let me know and I will edit. I hope this is helpful to someone! I know it's not much—just compiling known information into a step-by-step format—but I wanted to contribute back to the MIDIbox community in some way. Nice walkthrough about your experiences around 6582 PSU , might be a nice add in the wiki . You might ask a wiki account to @smashtv or @Shuriken to do that. That's a really good idea; I actually haven't figured out that part of my build yet. I had actually planned on connecting J1A to a panelmount barrel jack so I could use a standard wall-wart without modification. Upon investigation, however, the placement of J1A interferes with the obvious placement of the barrel jack on the rear panel. So I may end up putting a 7-pin DIN on a wall-wart, as you've done. Either way, once I have a permanent solution, I'll take pictures and add it to the tutorial. Thanks for the writeup, and I second the idea of making a wiki entry. The diagram needs work, maybe choose a better-contrasting font. As well, the correct connections/mods/swaps can be indicated on a PCB diagram for improved clarity. I think someone may have done that already. 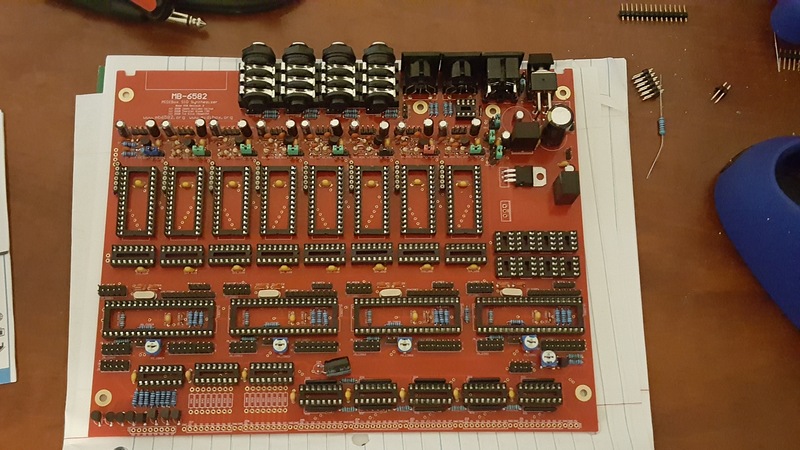 What I would really love is a high-res scan or clear photo of an unpopulated board. I didn't think to take one, and I couldn't find one on google images. I just know that when I was a beginner, PCB diagrams were kind of hard to follow. Try this link for some scans mate. I am about to start this myself thanks heaps for the help! These scans are pretty cool , it should end in the wiki too !! As some members mentionned , off-site doc tend unfortunately to disappear along time. I tried to attach them to the post but it came up with an error. Maybe the files are too big? That's right, file size is the problem here. FWIW I've also had issues with some PNG encoding, even with small file sizes. Either way, I think the wiki is a better place for those scans, with the rest of the documentation, as opposed to buried in the forums somewhere. 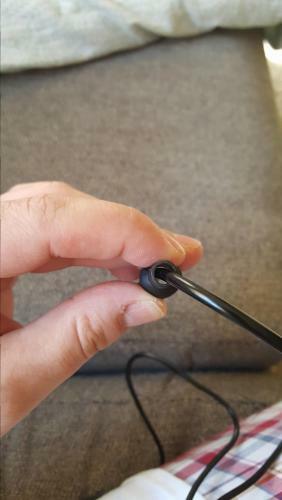 did you tie a knot on the cable inside the strain relief for the DIN connector to help take force away from the solderd joints if one tugs on the wires insted of the connector? Luckily i have 2 neutrik DIN connectors i bought when stocking up for mb-6582 build in case a day like this ever came, I love when extra components lying around become needed. I also have a 12 VDC 2A psu from an old Western Digital external hard drive I have lying around. Could be quite a cheap and common place PSU to use for MB-6582. Excellent write up Jaytee, this is exactly what i wanted to see! It was a long time coming but finally we have the perfect replacement for the c64 brick thanks to Altitudes findings. Ooo thats even fancier! 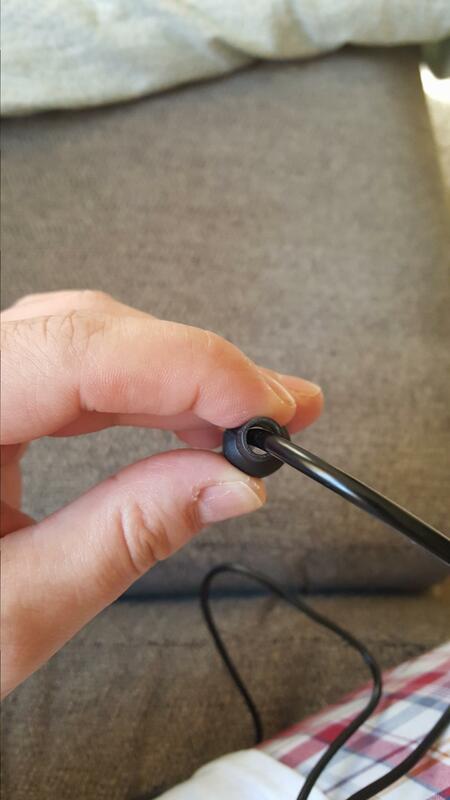 Do you have any online link for the heat shrink you used? Maybe something like this but a smaller diameter? that looks right, I used 11/32", you want something big that results in a large diameter to make up the for the small size of the DC power leads. Yup, backwards, sorry. If the 5V were the backwards one you could readjust the wiring but I'm pretty sure you should just desolder the 9V. Lol yea I already desoldered it and reinstalled. The gauge of the wire is much smaller than the sleeve on the DIN connector. Obviously this isn't major but it's really triggering my OCD. I guess cracking the PSU enclosure and running a thicker gauge is the best way? 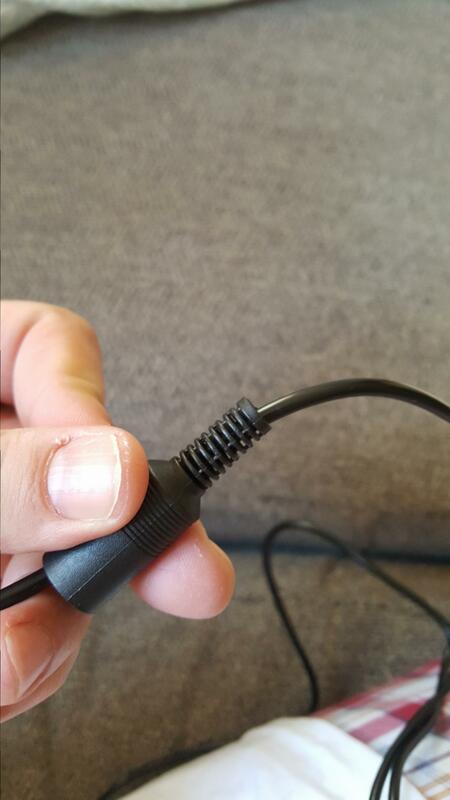 I think cracking the adapter open is probably a dangerous idea. Small chance you'll ever get it back together. I would either deal with the smaller gauge (after it's all built, how often are you going to be looking at the plug?) or install a panelmount 2.1mm barrel jack in the MB6582 so you can just use a stock adapter. Soldered up the DIN, powered it up. 5v to all the sockets and 9v on the SIDs!! Now on to the CS! This is the best solution for a PS. Thanks everybody that was involved in this!